Winner of the Vienna Film Music Award 2016! 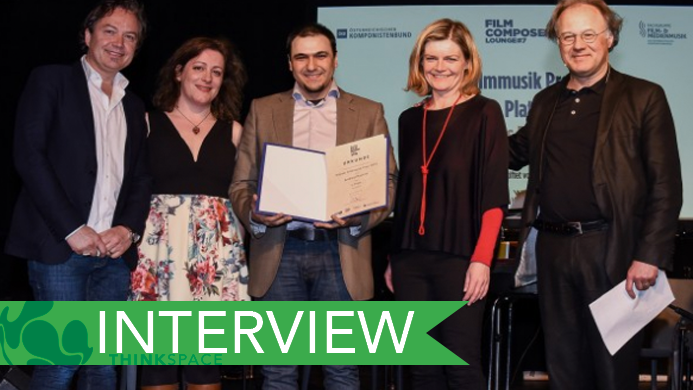 THINKSPACE STUDENT WINS VIENNA FILM MUSIC AWARD 2016! We are very happy to announce that, composer and ThinkSpace student, Andreas Rautner recently won the Vienna Film Music Award 2016. We are absolutely thrilled for him and thought that we would share this interview about his success. Q: How did you find out about ThinkSpace? A: I guess it was in 2012 or 2013 when I first thought about going back to university to start studying composition. Since I just missed the registration period, waiting another 18 months to get the chance to start with classes didn’t seem very attractive to me. So I started by jumping right in – learning by doing. I must have stumbled over ThinkSpace Education’s master’s courses a year later or so, when I was looking around for distance learning programs offered by Universities. Since some of postgraduate degree courses I found required some form of first degree, I discarded this idea at that time. Q: Why did you decide to sign up, and what’s it been like learning with ThinkSpace? A: The 2015 Black Friday sale caught my attention – I’m pretty sure I saw a Facebook ad or an article with a link. When I first read about the ‘Music For The Media’ course, I was absolutely thrilled! The sale also included one of the smaller short courses and it was there that I found out about the absolutely fantastic mixing course with Jake Jackson. As a Spitfire Audio customer (I just love them!) I knew about Jake and since I never spent much time on improving my mixing skills, I was absolutely hyped! It has only been a few months now since I signed up, but I’m still as happy as I was from day one. Learning within ThinkSpace’s environment has been a very positive experience. It never felt like being ‘back in school’. It feels much more like being part of a community with people, who all share the same love and passion for composing music. Q: What’s your favourite thing about ThinkSpace and the way they do things? A: My favourite thing about ThinkSpace is the unique way of how I actually learn. The written course materials are a good way to get your head around new lessons or new topics. The interviews provided also help to get a better feel and understanding about what’s really involved when you are an actual working composer. But the tutorial videos are probably my favourite part of the course material. I think they are an important part of any up-to-date learning platform. Another paramount thing for me about ThinkSpace is that I really love the way I learn; every module includes an assignment job. The idea of using actual ‘real life’ jobs and scenarios is incredibly valuable. Every assignment for me means pushing myself into new terrain. Having a tutor I can talk to, having fantastic student support and having the ThinkSpace community to exchange thoughts and experiences with are the reasons I feel comfortable to push my self with every assignment! Q: You recently won the Vienna Film Music Award 2016, how did that feel/what did that mean to you? A. Yes, I won the Vienna Film Music Award 2016! Well, how did that feel? Really great! Because at that point, I knew I made the right call a few years ago. It was the right decision to follow my love for composing music and trying to actually become a real composer. With 24 years of age, that was probably quite a late decision to make! But I couldn’t stand the thought of future-me looking back and regretting that I didn’t at least try. I think a lot of people around me just saw my music as some kind of nice hobby that you do on rainy weekends. Also questions like ‘Is that even a job?’ or ‘You don’t make much money with your music, do you?’ kind of hurt when I talked to people about my passion for composing music. Winning such a prestigious film music prize, supported by the Austrian Composer’s Society, is a wonderful acknowledgment for me. I feel like I am on the right track. Q: Your winning piece, tell us about how you approached it? A: The music I won the award for was for a short clip from an Austrian film production. Actually the scene was quite tricky, because it basically didn’t ask for any music for the vast majority of the 5 minutes. So firstly, I approached only 2 parts of the film clip that worked well with music. I always tend to load a classical symphony orchestra template for these kinds of compositions and so I ended up with an orchestral mock-up of my ideas. I took an early draft and let a few people have a listen. They told me they liked one or the other idea and that it sounded quite nice. It was at this moment that I realised that people referring to my music this way was not going win me the award! If I wanted to get anywhere with my music, I needed to go that extra mile. Throughout my composing journey, my focus has always been orchestral soundtrack music – I hardly used any synth sounding instruments in my compositions. The scene setting for the clip was some kind of subtle horror/thriller setting with one shock moment. I had a feeling, that I need a few synth sounds for this – but being more experienced with traditional orchestral instruments, I guess I just tried to play it to my strengths. Well – if there is one thing I learnt from my short time at ThinkSpace so far, that challenging myself is always highly rewarding! Pushing myself is the best way to learn and succeed, because I can enter a whole new world of creativity! I started exchanging parts and bits of the orchestral instruments’ parts with all sorts of synths, deep pulses, noises & ominous drone sounds and in the end I was able to create an ambient-like hybrid score, with only a few very cleverly placed musical elements. Over all, perhaps not the most beautiful or touching music I have ever written, but a well produced, detailed, believable & authentic score blending very well with the picture. That’s probably, what convinced the judges in the end! A: Ah, that’s a big question of course! The prize I won was awesome which also came with some good money – but I think the most important thing to do now, is to make use of the gathered momentum that came with this situation. Making good use of new contacts and also looking for more contacts is what I’m going to do next. I hope that my film music award will be a nice door opener for that! But besides getting work, I am still studying with ThinkSpace- maybe they might let me do one of their master’s courses somewhere in the future! BIO: Born in Romania, but raised and educated near Vienna (Austria), Andreas received his first piano & keyboard lessons during primary school. After many years of music school training and some experience in the local youth orchestra, he took his first steps as a composer at the age of 15. Andreas mostly writes music for piano, but also composes for very small ensembles. After finishing secondary school and military service, Andreas started his natural science studies at the University of Vienna. When virtual instruments and sample technology became somewhat more affordable, Andreas started to expand his composing spectrum with more orchestral sounding compositions, inspired by his enthusiasm for TV, film & video game soundtracks. Without any musical university background, the practical aspects and the aesthetics of music have always been the main focus of Andreas’ work. Self-taught knowledge about the tools & techniques of a composer have always influenced and driven Andreas’ love for film music & video game music. To find our more about Andreas and his work, why not check out these websites?